Each year there is something that jumps out at you at Quadstate. 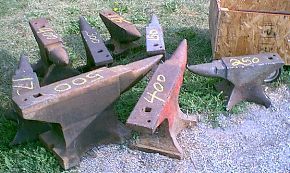 This year it seemed to me that there was a LOT of rail road rail anvils. I'm told that two years ago the most plentiful items were sheet metal tools. 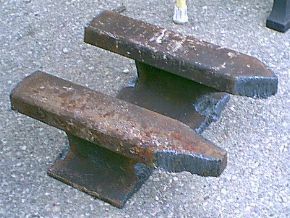 LEFT: These rough cut pieces have the flange under the horn and heel cut off short. 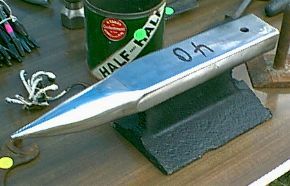 This is a not a good way to cut a rail anvil. 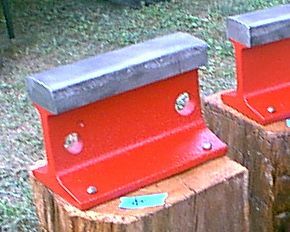 The anvil is too light not to have support directly under all the work surfaces. Short Horned dressed up and painted. 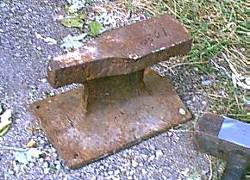 There was no shortage of "real" anvils as well. . . 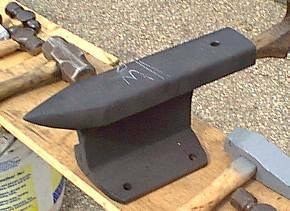 There were at least a hundred used anvils or more and dozens of new anvils available from Blacksmith Supply and Old World Anvils.